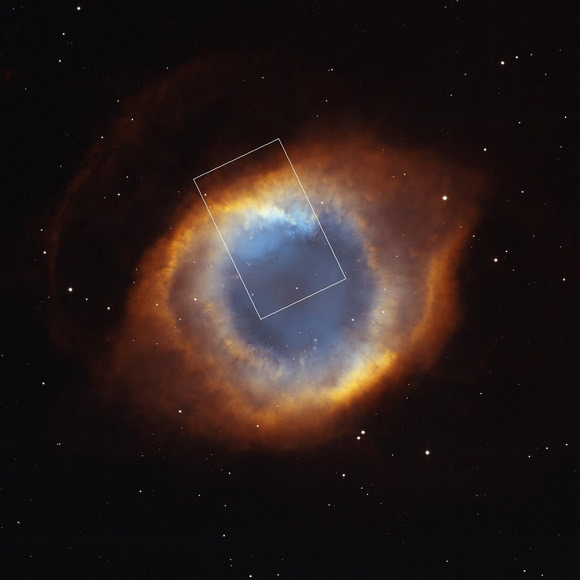 Astronomers working with the Subaru Telescope have released these new images of a “fireworks display” in a near-infrared image of the Helix Nebula, showing comet-shaped knots within. The Helix Nebula, NGC 7293, is not only one of the most interesting and beautiful planetary nebulae; it is also one of the closest nebulae to Earth, at a distance of only 710 light years away. The new image, taken with an infrared camera on the Subaru Telescope in Hawaii, shows tens of thousands of previously unseen comet-shaped knots inside the nebula. The sheer number of knots–more than have ever been seen before—looks like a massive fireworks display in space. Astronomers from the National Astronomical Observatory of Japan (NAOJ), from London, Manchester and Kent universities in the UK and from the University of Missouri in the US studied the emissions from hydrogen molecules in the infrared and found that knots are found throughout the entire nebula. Although these molecules are often destroyed by ultraviolet radiation in space, they have survived in these knots, shielded by dust and gas that can be seen in optical images. The comet-like shape of these knots results from the steady evaporation of gas from the knots, produced by the strong winds and ultraviolet radiation from the dying star in the center of the nebula. These images enable astronomers to estimate that there may be as many as 40,000 knots in the entire nebula, each of which are billions of kilometers/miles across. Their total mass may be as much as 30,000 Earths, or one-tenth the mass of our Sun. The origin of the knots is currently unknown. I’m curious though, what exactly is a knot? A clump of hydrogen shielded by dust etc ? Since these knots are slowly destroyed, or pushed away, by stellar wind, can their density and/or distance from the star be any indicator of the age of the nebula? A preprint of the paper with MANY color and B&W images can be found here: http://arxiv.org/PS_cache/arxiv/pdf/0906/0906.2870v1.pdf . There are some pretty cool comparison pix with previous HST observations of these knots in different wavelengths. @Kaizad, from the paper cited above and other sources, it appears that the knots are composed of clumps of molecular gas clouds and dust, some apparently quite dense. Researchers are still unsure of when these knots were formed and exactly how to interpret various features seen in them ( i.e. the reason for their cometary or ‘head-tail’ appearance). The paper I linked to has many wonderful images of specific knots in various wavelengths and several interpretations of their appearance. The authors relate that their observations will probably not answer the question of the knots’ origin but may be useful in developing a cohesive model of the evolution and fate of the knots, so I would guess that information on the age of the Helix might also be deduced from their observations. Hope some of this has made sense 🙂 . Btw, the short paper has many references to earlier work on the origin, age and evolution of the knots. Thanks for the link Jon, I went through it when you posted it.